Christmas may be long over but it's never too late to sample a beer released specially for Christmas time. This is yet another product that I purchased at Quality Inn Beer Store in Winnipeg a month back - seriously, that store has the best beer selection in all of Manitoba. 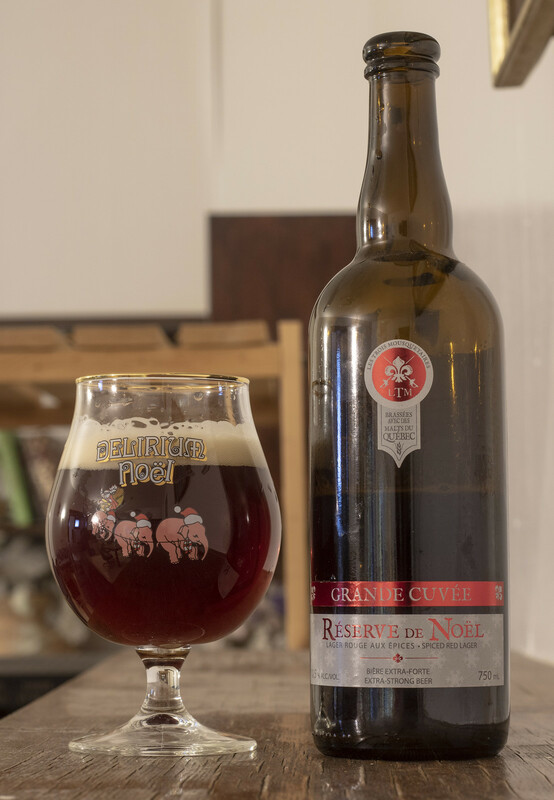 Apparently this beer, Les Trois Mousquetaires' Réserve de Noël was available through Liquor Marts, but of course none of the LCs in my city were able to get it in. The term "Red Lager"/Lager Rouge seems a bit weird to me, especially with the beer being 10.5% ABV, but in reality, the style is apparently a "Winter Warmer". Appearance: Pours a rich ruby red body with a bit of clarity to it, moderate amount of carbonation and a fairly thick amount of beige foam on top with a light amount of lacing on the side of the glass. Aroma: My initial impression was gingerbread cookies! It's quite sweet and definitely already seems like something that would be very appreciative to leave for Saint Nick on Christmas Eve.. but only a small sample because drinking and sleighing is a serious no-no! It's decently sweet with a nice caramel aroma to it, a bit spiced with a hint of nutmeg, a touch of oak and an ever so slight presence of vanilla. Taste: Incredibly intense booziness right from the start - it's almost like as if the beer was condensed a bit, not that it's a bad thing.. but I was shocked how sweet and powerful it was right from the beginning. A LOT of caramel at the beginning that almost makes me feel like I'm going to get diabetes from this beer, followed by a moderate amount of gingerbread to it.. but not quite as much as in the aroma. There's a bit of a Bourbon-like presence popping up here and there with a hint of oak, a bit of vanilla that I'm only noticing as part of the aftertaste. Once it warms up, more of the gingerbread starts to settle in the taste.. but it's mostly full on caramel syrup all the way through. Overall Thoughts: This was bottled on November 24, 2017 so it's aged a bit. It would have been interesting to age this a few years and see how it turned out then, I think it'd be even more of a bottle of diabetes than it already is. At 10.5% ABV, the alcohol creeps on you but it feels more like this might be 13-14% as it hits you near automatically. This is way too sweet for me, but I do like the gingerbread notes that pop up once in a while, as well as the various spices that show up more and more as the beer warms up, such as the hint of oak and vanilla. At $12 per 750mL bottle, this is quite a steal, but I seriously recommend not drinking this on your own, this is definitely a bottle share kind of beer.